At some point in most video shooters’ careers, they reach two important conclusions. First, audio quality is at least as important as video quality, particularly for streaming where degraded video is common on premium sites but pristine audio is the rule. Second, cheap audio gear simply doesn’t cut it. Spielberg could produce stunning video quality with a $200 camcorder, but give him a $100 wireless lavaliere set and it will sound just as lousy as yours. After a political campaign season marred by sub-par audio experiences, I decided to man up and spend some serious cash on a wireless lavaliere system. Around the same time, the Sennheiser EW 112P G4 Omni-directional wireless lavaliere system became available for review, and I was able to use that for my final shoot. This review details my field experience and later quality-related tests. Sennheiser sells multiple models of this package, including one with a cardioid microphone, so check model numbers before buying. Amazon details the different models, which I mention because the single one-star review on Amazon (compared to three five-star reviews) complained about getting an omni-directional microphone instead of cardioid. For those who trust B&H reviews more than Amazon, the unit garnered two five-star reviews and one-four star review there. The G4 package comes with a transmitter pack and receiver, both manufactured from extremely sturdy plastic. The receiver comes with a belt loop and an adapter for the cold shoe on a camcorder. You get two screw-in output cables, one with a 3.5 mm male TRS output cable for DSLR cameras and the other with an XLR connector, which I used for my shoots and testing. The transmitter has a screw-in connector for the microphone and a mute button on top. The on/off switch is in the easily accessed battery compartment, so your talent can’t accidentally turn it off. 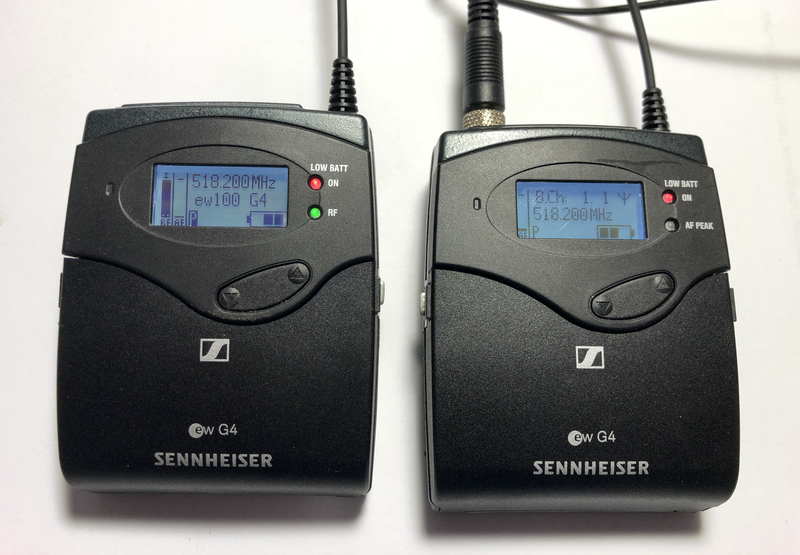 Both units are powered by two AA batteries which Sennheiser provides. According to the product’s specifications, the batteries should run up to 8 hours with a range of 100 meters. This particular set runs in Frequency Range: A, which is 516-558 MHz. Figure 1 (below) shows the two units with the receiver on the left and the transmitter on the right. The receiver has two bars on the left, one showing the RF signal strength, the other showing incoming audio volume (with silence in the display). The center of the display shows the signal frequency with the name of the transmitting microphone below. The transmitter shows the channel and frequency, with a volume meter on the left (again, showing no volume). Both units have a battery indicator on the lower right and the on button will flash on and off when power gets critically low. I received the system the night before a shoot. When I turned both units on, they instantly paired, always a relief. When I plugged the receiver into my camcorder, the signal was quite loud, despite relative quiet in my office. I fixed this by adjusting the sensitivity of the transmitter down to -38, which was the value used in all my tests and shoots. Other than that, I didn’t adjust any of the controls on either device. Incidentally, you access the menu via a button in the battery compartment, which you can easily access by pressing buttons on both sides of the front of the unit. Reading through the documentation and online descriptions, I got the sense that there was significant configurability beyond the items I adjusted. Don’t tell my editors, but while I’m pretty proficient with most prosumer-level cameras, I’m a neophyte when it comes to audio, including microphones and soundboards. I just wanted a unit that was easy to setup and configure and produced pristine audio, and the G4 delivered on both counts. My first shoot with the G4 proved uneventful, which translates to outstanding in my book. 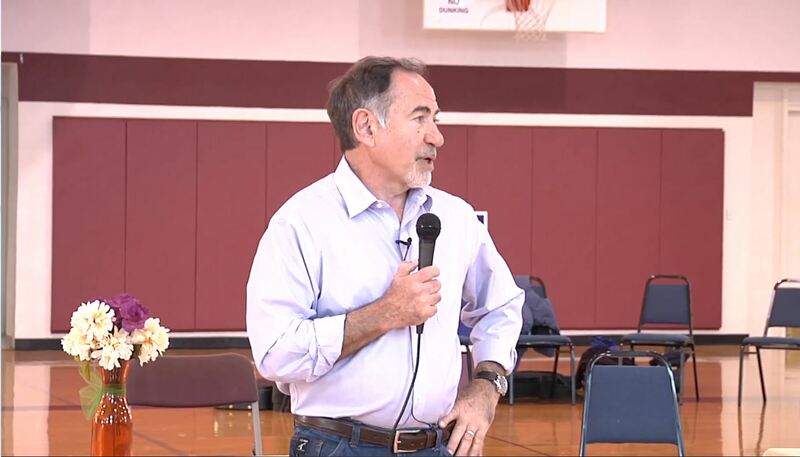 As you can see in Figure 2 (below), I mic’d the candidate, but he also used a handheld mic for the sound system in the gym. You can watch the video on Facebook. I was concerned that the nearby portable speaker could cause echoing or other problems, but other than the voice sounding a bit harsh (which could have been the candidate’s voice), the audio sounds great. Though I didn’t test the specified 100 meter RF distance, I had to perform my sound check with the candidate at least 40 yards away, and it was almost disconcerting how close he sounded.